This tutorial shows you how to customise your own Aweber sign up form to attract newsletter subscribers. 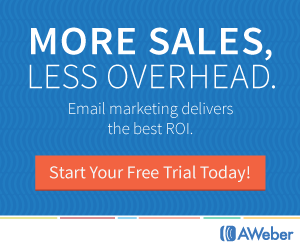 Aweber is a very popular email marketing service that manages your email lists for you. I use Aweber myself and can highly recommend their service. If you are not already using this service and would like to check them out for yourself, they still offer a $1 trial for the 1st month. Why would you want to customise your own form when Aweber provides so many ready-made sign up forms? Have you ever looked at the amount of HTML code that you need to paste into your site to display one of the pre-designed form templates? Yes, that’s right, there are lots of lines of code. Yes, this option means less code on your site. However, now your page has to retrieve the form’s code from an external source. In my experience this consequent delay causes the page to jump when it reloads. Not nice. If you customise your own form, you can put the message that YOU want on your submit button. You might like something a little more friendly and informal on your button than the wording that comes with a pre-set template. I have often found a reasonable looking template only to be frustrated by the fixed wording on the button. In some cases, there is quite a lot of empty space between the input boxes (for name and email) and the submit button. If you control the look and feel of your form, you can reduce this extra space significantly. You might struggle to find a pre-set template that suits your current website theme. If you opt for a customised form, you can choose the colours and fonts to suit. Well let’s get started on customising your streamlined form. We will use a trimmed down version of one of the forms that Aweber provides and then customise it to suit. If you already have lists on Aweber, choose the correct list from the Current List dropdown. Click on Sign Up Forms. You will then see a wide range of templates. But we want the simplest of forms as we will strip out most of the extras so that we can create our own controls. Click Popular >> Modern and load this template. If you hold your mouse over the form, you will see each different control highlighted and displaying a red cross in the top right hand corner. You can see this in the screenshot below. Save your form and Go to Step 2. You will now be on the Basic Settings Page where you can name your form. This is simply the name that you will see in your dashboard; it won’t appear to your readers. I like to use a descriptive name so that I am reminded of this form’s purpose when I look at the list of forms that I have created in my dashboard. For example, you can use a name that tells you where this particular form is to appear (such as your sidebar or below your header). The next option on that page is the Thank You Page. The Preview button will let you see the wording. I usually just go with the default but you can decide to return to the settings page later on and create your own if you prefer. I do the same with the Already Subscribed Page; I leave it at the default. Save your form and Go to Step 3. Step 3 takes you through to the Publish Page where you can choose who will be installing your form. You will be installing it so choose the 1st option. Click on the Raw HTML Version. Include beautiful form styles. Uncheck to get unformatted basic form. Do precisely that, uncheck the box. Note: If nothing happens to the code in the box (i.e. you can still see <style type=”text/css”> at the top), then you need to refresh your page and go back into the Publish Page. This time, unchecking the box should work. Copy the code from Aweber and paste it into the code window of a new page (via your HTML editor). We won’t be publishing this page, we are just using it to design how you would like your form to look. The only blocks of code that are needed are shown in the screenshot below. Delete the lines of code in between. Now we will add code that will display a message followed by the email, name and button controls. First, add your form message right where the red arrow is pointing, a message such as inviting a subscriber to sign up to get your post updates. Add the following 3 lines of code under your message. Unless you already have styles in your stylesheet for forms, then this sign up form will look very, very bland at this point. Now it is time to give it some style. Wrap the 3 input lines of code in their own div so that we can apply a class style to how they look. At the bottom of your stylesheet you can add any styles that you like, for each of the controls, if you are familiar with CSS. If not, then you can start with the following suggested styles and edit them to suit. Save your page that contains the form code, again without publishing it. You can preview your form to see how it is looking. Copy all of the code between the AWeber comments (including these 2 comments) into your sidebar text widget or to a location of your own choosing. So, we now have a form that is not bloated with code but one that you can alter to suit. You can edit the styles until you have the colour scheme that you are after. You can re-locate your form to a different location. Just remember, if you want to have more than one form on your site, always start with another basic form from Aweber, one with a unique name, so that you can retrieve statistics that are relevant for each form. Have fun redesigning your Sign Up forms. If you have a customised form that you are happy with, let’s know via the comments. Sign up pages are very much important for any blog or product selling websites. This helps in increasing in users subscription list at a good pace…thanks for the wonderful tips and ideas. I’m pleased the tips on customising an Aweber form were of some use to you. Thanx for sharing tips on customising the newsletter this post turned out to be very helpful as this topic needs a lot of attention as it increases subscription on your website. Keep sharing such beneficiary post. I’m pleased you found this post useful for customising an Aweber form Priya. I am glad to find these codes on your site… i am really looking for something like this.